A dining room is a place to enjoy beautiful meals, great company and is often the main spot for any family party or gathering. Therefore, it’s vital that you choose the perfect flooring so that you truly relish hosting events at your home. What should I consider when choosing a dining room floor? When choosing a dining room floor consider how you will use the space. Some people use their dining room just for special occasions whereas other people will use their dining room as often as they use their living room. How often you use your dining room will affect what flooring you choose, as you will need something much more hard wearing if you’re going to be using your dining room every day. What dining room flooring options are available? 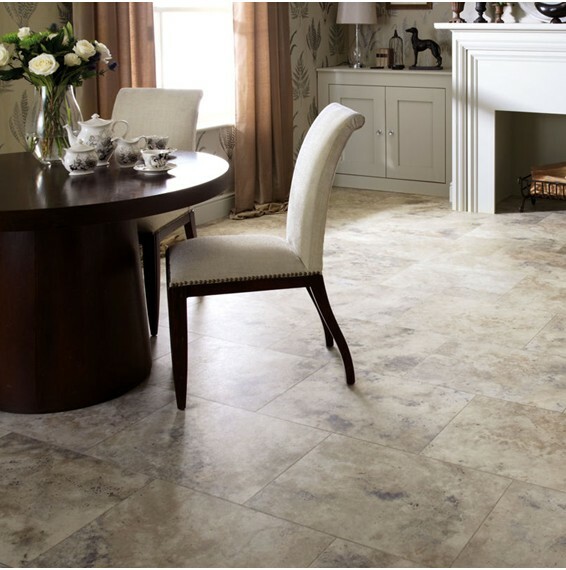 Vinyl is also a popular choice for a dining room, as there is such a beautiful range of vinyl flooring products available you’re sure to find a design and style which would suit your personal taste and needs. Not only does vinyl look beautiful in your dining room but it’s also easy to clean and maintain, so if you intend to use the dining room daily then this could be an ideal option for you. 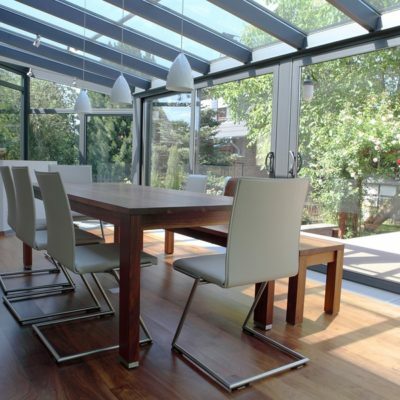 You can choose solid wood flooring for your dining room if you don’t have under floor heating as the solid wood floor won’t be able to cope with the rises and falls of temperatures. If you do have under floor heating or the dining room experiences a lot of humidity, then it could be a wise choice to choose engineered wood flooring or laminate. Laminate flooring is a popular choice for a dining room as it’s a cost-efficient way of bringing the wood effect into a space. Laminate flooring looks sensational against any wooden furniture, such as a large oak dining table. Plus, it’s also easy to clean and stain resistant, so it could be the perfect option for big families or if you intend to host a lot of parties. Carpet can work very well in the dining room as it adds warmth and comfort, which sometimes a dining room requires as they tend to have much less furniture than the other rooms in your home have. Also, fresh neutral colours can work beautifully in a dining room. How do I know which flooring is right for me? Real wood looks beautiful in a dining room, especially if you have a large oak table or wooden furniture, however it can be costly. 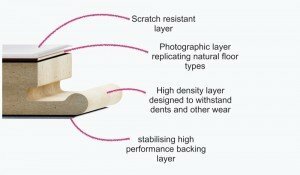 Laminate flooring is the perfect alternative if you like the look of real wood but don’t want to pay the price for it. There are so many different styles available so you’re sure to find the right design and colour of laminate flooring which suits you and your needs. Laminate flooring is timeless as it won’t go out of date unlike some carpet styles will. It will arguably last a lot longer than a carpet would and therefore save you a lot money. If you’re seeking something which is easy to clean, won’t absorb smells or spillages and obviously won’t encounter rips or tears then laminate flooring could be the ideal option for you. They are also considered as neutral flooring as laminate flooring will go with almost any interior and décor style, so if you’re unsure on how you want to decorate the rest of your room laminate flooring could be a good option. Carpet in the dining room could work well, as if you have little furniture in your dining room it could help to create a more comfortable feel. However, if you have small children who are likely to drop food or spill drinks then it could be difficult to keep clean. Laminate or vinyl could potentially be a more practical option for families as it’s easier to clean and stain resistant. If you do really like the look of carpet, then we would advise to choose a carpet which is stain resistant and hard wearing. Vinyl isn’t just for bathrooms and kitchens, as some people may think. 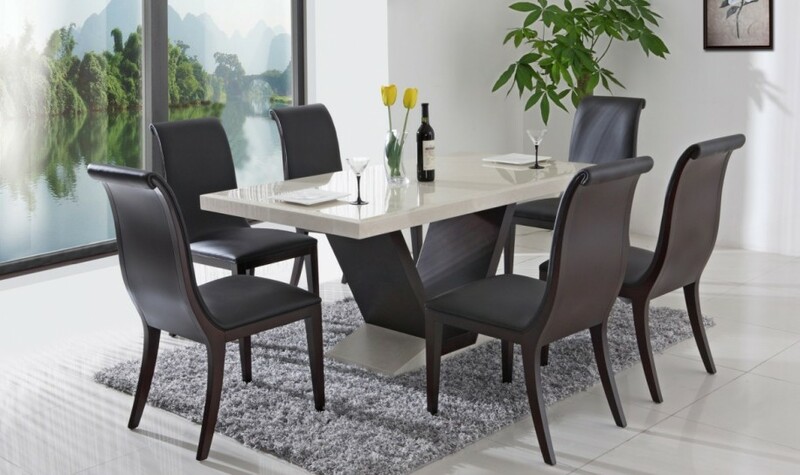 It can be a fantastic option for any room in the home, including the dining room. This is because it has the look of a wooden floor, which works perfectly in a dining room, but without the cost and upkeep of a one. It’s considered as a practical and functional choice of flooring whilst also adding style to a room. 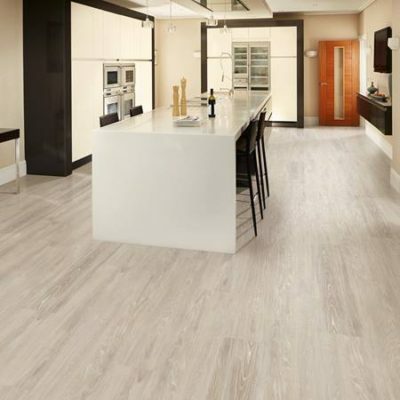 You will also be pleasantly surprised by the range of options available for vinyl flooring so it’s certainly worth looking through the selection we have on the website to see if you can find something to suit your taste. How do I care for my dining room floor? If you intend to use your dining room daily and have a large family, then it’s crucial that you take very good care of your floor to ensure that your floor lasts. 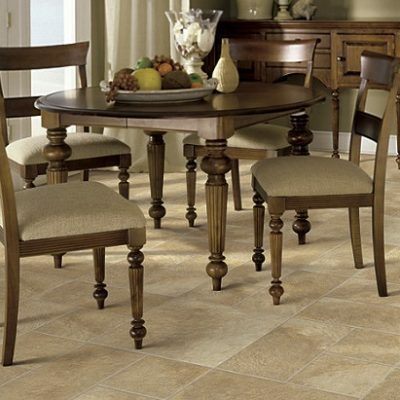 How you take care of your dining room floor depends on how often you use the room and what flooring you’ve chosen. If you have a carpet then it will need vacuuming on a regular basis, at least once a week, to ensure that there is no build-up of dirt or dust. It’s also very important to give the room a deep clean at least once a month using carpet shampoo or a steam cleaner, this is more important if you have a large family or use your dining room on a regular basis. With laminate and vinyl flooring it’s important that you clean up spillages immediately and don’t allow the water to just sit on top of the surface. Not only is the safety hazard but it could also ruin the floor and cause long term issues. As well, make sure to sweep the floor daily and clean the floor weekly with warm water and detergent using a damp cloth or mop.